The National Honor Society is a national high school organization, sponsored by the National Association of Secondary School Principals, giving recognition to outstanding students on the basis of scholarship, leadership, service, and character as shown in the school. National Honor Society Faculty Council, consisting of five faculty members, excluding the faculty advisor and any administrators, makes election of the members to the chapter. Parents and students must understand that no student has a right to be selected for membership in a chapter of the National Honor Society on the basis of grades alone. To be considered for membership, juniors must have taken twelve credits of twenty listed courses open to students through the junior year and must have achieved a grade point average of 3.60 in these courses and an overall grade point average of 3.75. To be considered for membership, seniors must have a grade point average of 3.70 and an average of 3.60 in sixteen or more semesters of core courses. 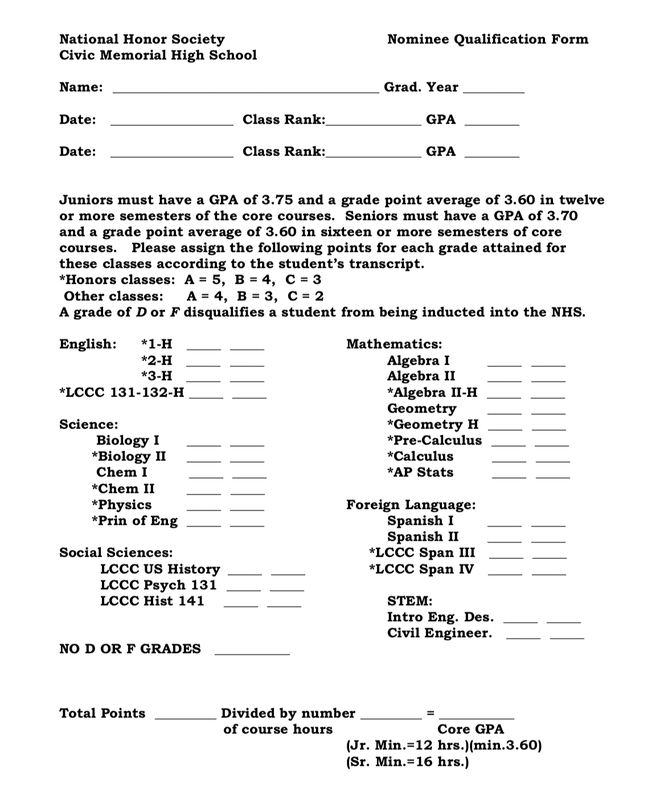 A student who has earned a semester grade of D or F in any class will not be eligible. To retain membership, students must have taken sixteen semesters of the listed classes by their senior year. As juniors students will need twelve semester hours, and as seniors, sixteen semesters of the listed courses. Beginning with the freshman class entering in 2005, to be considered for membership students will be required to have participated in three community and/or church sponsored service projects by the end of the junior year. Students who meet academic criteria for selection will be invited to provide information about service and leadership on an application form. It is necessary that students show some evidence of participation in school activities and community and/or church sponsored service projects. Faculty is then asked to review the list of those who apply and make recommendations as appropriate. Final selection rests with the faculty council. Beginning with the freshmen class entering in 2004, senior members will be reviewed by the faculty council for academic, service, leadership, and character traits. Those members found to be no longer satisfying the standards set forth by the National Honor Society will not be allowed to wear the National Honor Society cowl in graduation ceremonies.